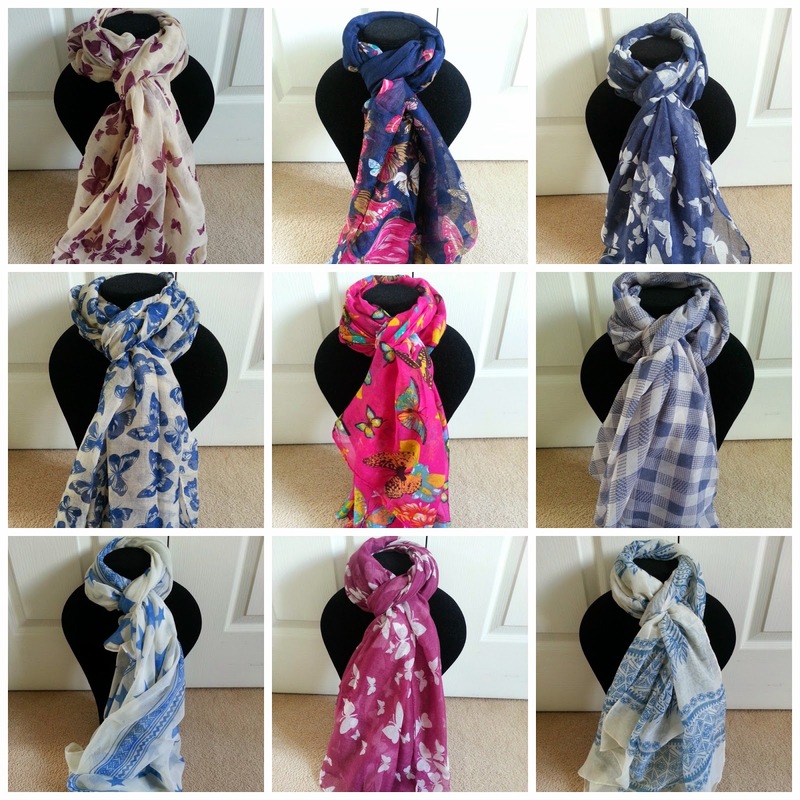 Avenue 57: Pretty Scarves - how many? How many scarves do you own? I own 24!!! Around your head as a headscarf when in a convertible car!!!! There are so many ways to tie a scarf and I'm still working out how to do a crib sheet of simple diagrams to teach you new ways. 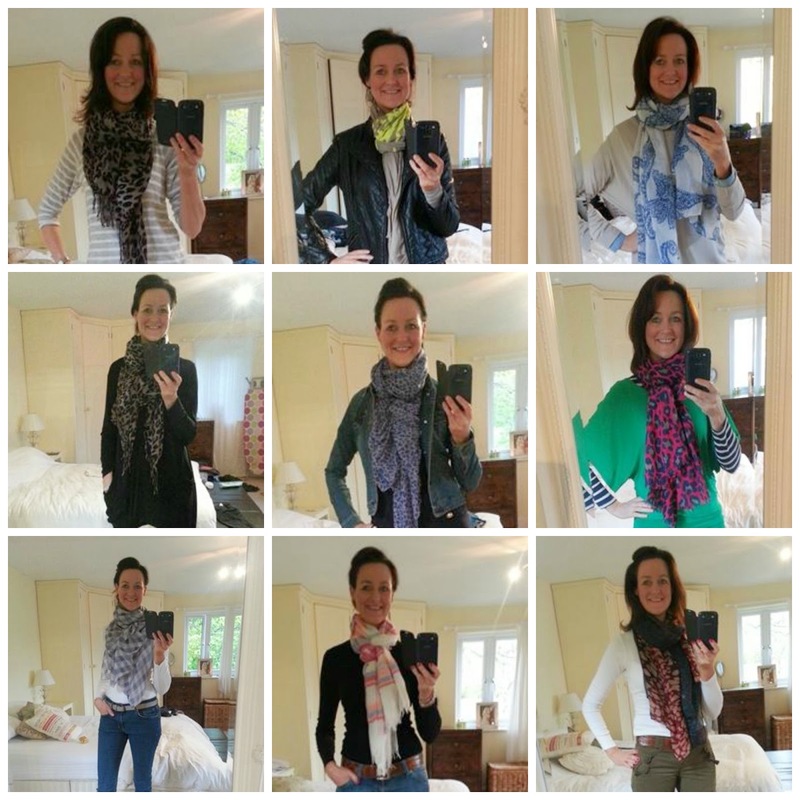 We ALL get stuck in a scarf styling rut and I bet we only ever use 1 of 3 ways regularly. I also sell scarves which makes my addition to the collection too easy. I can't stop stealing them! Here are some of my favourite ones. Click HERE to buy online. I'm currently offering free delivery so just select 'local pick up' at the checkout. Go on, count how many scarves you have and tell me you have more than 24 (I actually thought I had a lot more, 24 is sheer amateur stuff)! Given that you sell scarves I think 24 is quite restrained, I imagined it would be an awful lot more than that... I have more than 10 but less than 24. Maybe around 15. I've never counted them up! I think my favourite of yours is the pink and blue leopard print one. I think I've been remarkably good too!!!!!! 15 is a healthy number too! I love scarves, I hate being cold! Go on Lynne, be brave - I will guess at 45! I seriously have no idea but I only wear maybe about 10 of them. And I just sold 10 to a friend as well. I have to say my colour palate is a lot more subdued than yours - I used to have a lot more colours I'm sure of it. And only 24? Where are the rest? In which wardrobe in which room? Seriously, I only own 24! The shop owns a lot more! I think you can wear a dull outfit and jazz it up with neck candy :-)! Girl after my own heart - that's THE perfect way to do it! That Missoni looking one was £3 in the sale at Sainsbury's last year!!!!!!!!!! If I had an LV one then I would ONLY EVER wear that!! And here was me thinking Avril was the scarf queen!! Although I'm sure I'm not far behind u!! You and I have that cream chunky knit one from Zara - LOVE IT!!!!! I couldn't spend more than £10 on a scarf - I love too many! I dread to think how many scarves are stashed away around the house. I am always cold so I can't do without a scarf especially in the autumn/winter. Loving all the huge scarves that are around and how they can double up as sarongs on the beach. I'm going to use some of mine for just that - sarong! 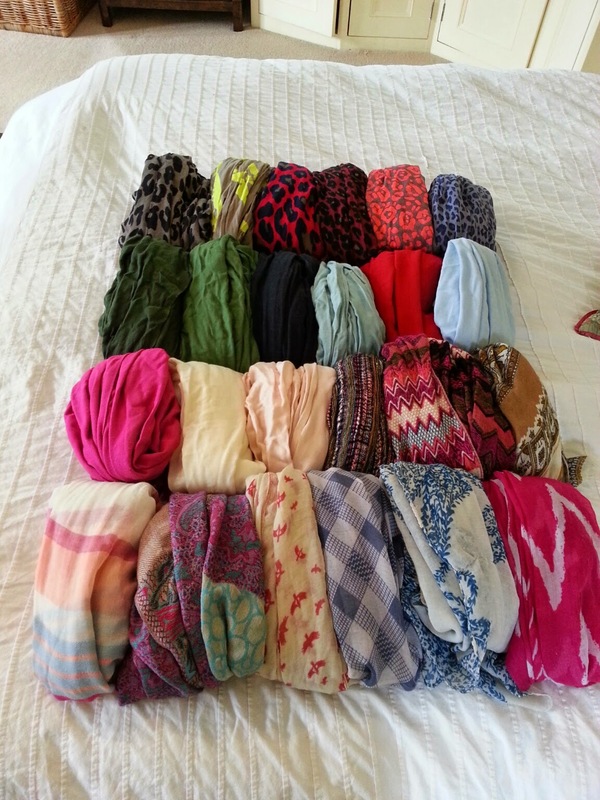 wow that's certainly a decent collection for anyone ;) i'm actually trying to work more scarves into my outfits going into winter here in australia. Now is the perfect time to wrap up :-)!